At Columbia University last night, students gathered on the library steps to protest the university’s investment in oil, coal, and natural gas companies. Columbia Divest for Climate Justice (CDCJ), founded in 2012, is a student coalition campaigning for Columbia University’s complete divestment of fossil fuels. The use of oil, coal, and natural gas contributes to global climate destruction, and the students believe Columbia should back down from investing in companies that profit from fossil fuels. Last Thursday, CDCJ students staged a protest sit-in outside Columbia University president Lee Bollinger’s office, refusing to leave until Bollinger publicly endorses divestment. So far, the sit-in has attracted support from celebrities like Mark Ruffalo and presidential candidate Bernie Sanders. But it hasn’t been easy. Following the protest, the administration shut down Low Memorial Library—the location of the president’s office and Columbia’s central administrative building—making it difficult to get food and supplies in for the protesters who have also been threatened with suspension. Today, protesters have been sitting-in for over a week with no Bollinger in sight. 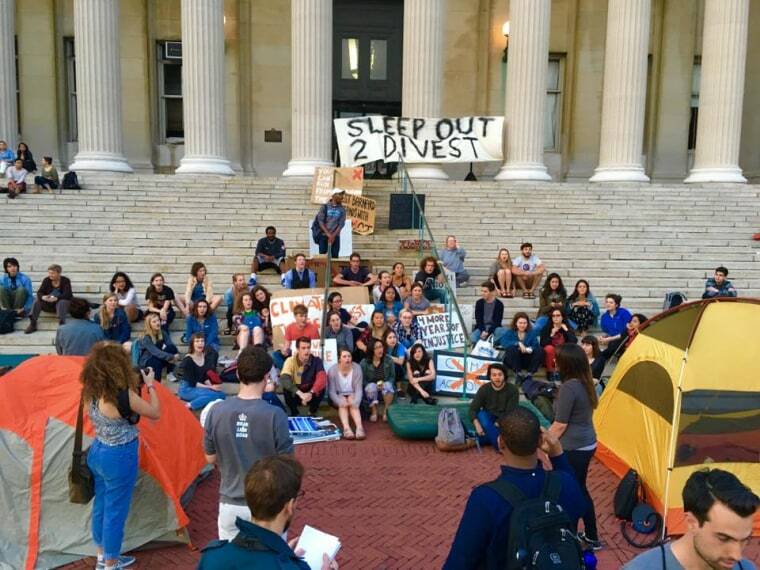 Instead of surrendering, the CDCJ organized a divestment sleep-out on Low Library’s steps last night to support those students still in the library. Allies came armed with tents, sleeping bags, potluck dinners, and high spirits. The sleep-out began in the evening and carried late into the night, gathering over 100 student supporters, with solidarity from other student groups such as the Mobilized African Diaspora. With hope for the future of our environment, these Columbia students continue to fight for fossil fuel divestment and find strength in each other. The feeling of community and resistance last night was undeniable.